President Goodluck Jonathan on Sunday justified the “no work no pay” policy adopted by his administration against the striking polytechnic teachers, saying the laws of the country required that workers should not receive wages for the period they would be on strike. The president stated this while fielding questions from a four-member panel of interviewers during the Presidential Chat. Mr. Jonathan explained that he was not the one that put the law in place, stating that it had been in existence before he assumed office. The federal government is currently implementing the “no work no pay” policy against striking lecturers of the polytechnics and Colleges of Education in the country. The polytechnic teachers under the aegis of Academic Staff Union of Polytechnic, ASUP, have been on strike in the last eight months to press the government to reverse the dwindling fortunes of the polytechnic education in the country. 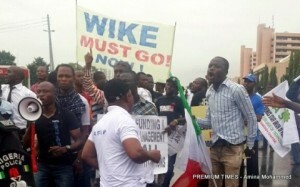 The union had however said it was not bothered about the implementation of the policy. “It is not about money as some have viewed it,” the Union said, insisting that it would not back down on its 13-point demands from government. But Mr. Jonathan said the lecturers should not expect to be paid during the period they are on strike.